Click HERE to see a list of all of the available customization options! 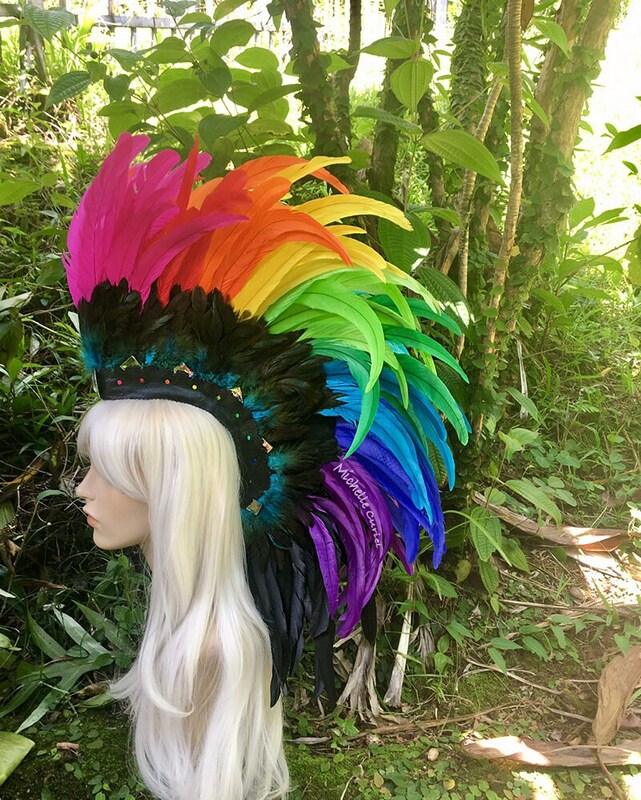 Crown yourself with this beautiful wearable work of art Feather Mohawk and feel the magic that comes with it! Get ready to steal the show, meet new exciting people, and make eyes light up when they lay eyes on you! These pieces are made to make you feel even more amazing than you already are....THIS is what it feels like to be a star! Each piece comes built onto a banana clip with full instructions and ties that I provide. They are built to withstand high wind and dancing your heart away. If your hair is 2+ on top but short in the back, I will install a strap for extra security (+15) If your hair is shorter than 1" or bald and you do not have need for the clip, I will add straps instead. I have been to burning man 7 times since 2008 and am VERY careful to make pieces that are durable and are not going to fall apart when they get to the playa and moop all over the place. Not all feather mohawks out there are made to withstand the playa, so keep this in mind when making your selection if you do not choose to have me make one for you! I have also developed a "Dusty B)i(rd" clean and care kit to ensure your feather pieces last a long time. This kit will be made available for purchase in my store mid July 2017. I have made over 500 Feather Mohawks and head pieces to date, as well as hundreds of feather earrings and ear cuffs. Everything I have sold is by my own hand with no assistance or outside help, so each piece takes several hours and even days to make from start to finish and are made with a lot of love and my full devotion. With each new piece I make, I learn something new and have improved upon my design. Even pieces I made a few months ago are not as immaculate as the ones I am making now. My workmanship has improved and I aim for excellent craftsmanship in each piece. The time and quality to make each piece has greatly increased since I first started making them back in 2011, which is why there will be a slight price increase over time. ♥ This is a made to order item. Pieces in photos have been sold. ♥ I can fully customize this or any piece you see in my store (See below for all options). Prices subject to change depending on materials and time. ♥ Please allow 1-12 weeks for completion. But please don't let that timelie scare you. It all depends on my workload, inventory and the time of year. The average turn around time is 4 weeks, however I can make it for you as soon as a few days, please just let me know when you need it and chances are I can make it happen! ♥ I believe in clear communication! Feel free to send me a message here or even call or text me directly at 808-799-5755 to ensure I can have it made for you in time! ♥ If you would like to purchase now, just let me know what date you need it in your hands by during notes in checkout. If I cannot complete the order I will give you a full refund immediately. If you purchase without any date in notes, I will assume it is not a rush order and complete as time permits. ♥ If you are not in a rush and can wait a few months, I will include the best feathers, communicate with you as I create the piece and some free gifts too! This also allows me to not rush and results in an even more immaculate piece! Each piece is made with exquisite craftsmanship completely made by my hand, made to last through the harshest, windiest conditions so you can wear over and over again, and also display in your home. Want a discount? Contact me for details on how... I also take payment plans - if you cannot afford the prices please don't hesitate to talk with me on how we can work something out for you! Each piece is entirely handmade with love by me, and includes an authenticity tag "handmade by Michelle Curiel" they are also named and numbered (number is based on total mohawks I have made to date). This is not only a headpiece - it is a work of art from the heART! ❥❥❥ CUSTOMIZE YOUR FEATHER MOHAWK!!! Below are some extra additions you can add to your mohawk. If you would like me to make you a customized listing - please send me a message and I can send you an editable document so that you can let me know exactly what you want! Most of these customizations can be found in the "ADD-ON" section of my store. __+$30-$100 Pure white feathers. If you want your mohawk to have long and short white feathers. White feathers cost up to triple the amount than colored feathers, pricing depends on how much pure white you want in your piece. If you want just a few accent whites (up to 6), there will be no additional charge. __+$10-100 Exotic feathers. Pricing depends on what kind and how many exotic feathers you are interested in. ___+$60-80 Dangles! (Detachable) To be worn in front and go above or below chest area. ___+$100 Matching Feather Shoulder Shrug 1-2 colors (Open in the back so that the back of your mohawk & your tail does not interfere with the shrug. ___+$150 Matching Feather Shoulder Shrug - as many colors as you want Elaborate, more feathers, longer, rhinestones, etc. ___+$30 Tote Bag to easily carry your mohawk & accessories when you're on the go! I can add lights to your piece with LED, EL Wire, Fiber Optics, etc. pricing will vary depending on how much lighting you want. Can be anywhere between $20 for fairy lights or something more complex with remote will be up to $200. If you are interested we can discuss and i can give you a quote. *LED lights look best under pure white feathers. THE FESTIVAL I AM GOING TO HAS BANNED THE USE OF NATIVE AMERICAN HEADDRESSES, ARE YOUR PIECES NATIVE AMERICAN? Many Festivals have explicitly banned the use of Native American Headdresses, or more specifically the "War Bonnet." This has caused much confusion as to what is OK and not OK to wear when it comes to feather head pieces. Below is an excerpt from Wikipedia as to the style of headdress that most festivals have banned. "Feathered war bonnets (also called warbonnets or headdresses) are traditionally worn by male leaders of the American Plains Indians Nations who have earned a place of great respect in their tribe. Originally they were sometimes worn into battle, but they are now primarily used for ceremonial occasions. They are seen as items of great spiritual and political importance, only to be worn by those who have earned the right and honour through formal recognition by their People." I personally have a deep respect for the Native American people and because of this I do not take any custom orders to make anything resembling a war bonnet. Due to the fact that my pieces are called "Feather Mohawks" uninformed individuals may think that they are Native American Headdresses when viewing from the side profile, but if you take a good look at them side to side, you will see that they are completely different, and even use feathers coming from different species of birds. Furthermore, the word headdress does not solely belong to Native Americans. The definition of a headdress means "An ornamental covering or band for the head." Several cultures around the world, ancient and modern times have worn headdresses made of feathers, jewels, fabrics, bones, etc to adorn their heads. Furthermore, the "Mohawk" style has been also been worn in both ancient and modern times by cultures all over the world. But don't just take my word for it, if you have any question on the differences, please do a search online - there is a wealth of information out there, it's great information to know either way! 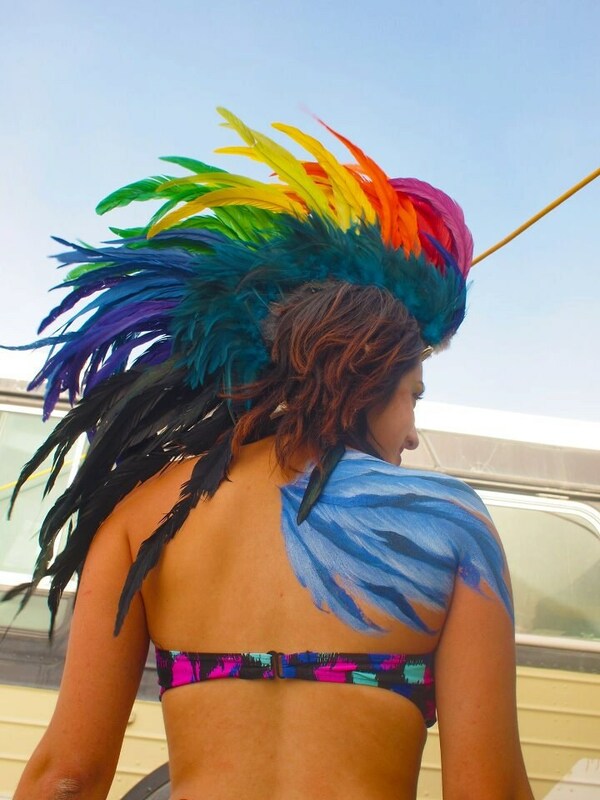 CAN I SEE SOME EXAMPLES OF PEOPLE WEARING YOUR FEATHER MOHAWKS OR OTHER CUSTOM HEAD PIECES YOU HAVE MADE? CAN I SEE IT BEFORE YOU SHIP IT!? Absolutely, at your request I'll send a photo of it before I ship it out for your approval. I want you to be thrilled and excited when you pull your mohawk out of the box. Also at your request, I can make a quick video so you can see your mohawk from different angles, just send me your phone number or email so I can send it to you. CAN I DANCE HARD IN IT? WHAT IF IT'S WINDY? It is built on a banana clip. I provide some ties that you attach to your head so that the tooth grabs on to the clip. For those that don't have hair, just let me know and I'll add some straps. Instructions on how to wear the feather mohawks will be provided with your mohawk in a brochure. As your request, I can also send you an instructional video. Please note: I will only share this video to those serious about purchasing. I designed this feather mohawk so that it would stay ON! It's not just a "for show" piece, it is a piece that can literally be worn all day and night - I even slept in mine once...don't ask ;) If you follow the instructions on how to wear it and really secure it in place(super tight hair ties in the center, extra hair gel!!! ), you should not have any problems with it falling off or getting loose. I KNOW I'M GOING TO BUY IT, BUT DON'T NEED IT FOR A FEW MONTHS, SHOULD I WAIT TO ORDER? There are a few advantages to ordering ahead of time. First, sometimes my feather wholesaler is out of stock of feathers and slows down the process. Second, you are put in the front of the line and are given priority over other orders and you can customize as much as you want until you are happy. Third: if you wait to order until the last minute, sometimes I am so over booked on orders that I have to cut back on orders. I have had quite a few orders that are 2-8 months ahead of what they need and it's always the best bet. No rushing, feathers will be in stock, extra customization, and sometimes I even include a few extra freebies! I NEED IT ASAP! IS IT STILL POSSIBLE TO GET MINE LIKE- YESTERDAY!? HOW SHOULD I STORE MY FEATHER MOHAWK? If you have a mohawk that contains natural colored feathers, Moths may become an issue. It also depends on where you live. Moths don't have a taste for dyed feathers and will not eat them, so if your mohawk contains mostly dyed feathers, this is not an issue. If you use the bag that it came in, be sure to lay your feather mohawk out in the shape you would like it to be when you wear it. Feathers are like hair, so they take the position they are in over time. If you want to have it out on display, choose a mannequin head online, with a wig. Glue the wig to the mannequin head and attach the mohawk to it. Another way is to hang it on top of a frame or some long nails onto a wall. Also, if you want the top of your feather mohawk to remain super tall, you can hang it on the wall with a thumbtack or nail upside down letting the feathers hang, or somewhere where it has room to spread its feathers out. If you like the curved back look to the mohawk, keep it in the bag or hang upright. I will say this over and over again, feathers are like hair, and will change based on how you store them. You can even curl them with a curling iron or straighten them too! MY FEATHER MOHAWK NEEDS SOME TLC. IS THERE ANYTHING I CAN DO TO CLEAN IT? Order my Dusty B)i(rd Clean and care kit! I also have the "Where'd it go?!" kit that has extra feathers and rhinestones customized to your piece or for a whole new look. Both Available for sale in my shop. If you do not see the listing, please contact me and I'll make you a listing. If you rather I fix it up for you, prices start at $40 and go up depending on how much damage has incurred. WHAT HAPPENS IF MY FEATHER MOHAWK GETS WET? Feathers can handle just about any weather condition because they were like hair to our winged friends and they got wet for regular showers when they belonged to the birdie that grew them! So if you get your mohawk a bit damp, it's OK! However, if it's pouring rain, it might be best to bring an umbrella..because I imagine you yourself aren't going to want to be sitting in the pouring rain! If your mohawk DOES get wet. Here are some tips when drying it out. Feathers are like hair, so keep in mind they will dry exactly how you position them when you take off your mohawk. Be aware of feathers that are out of place while drying your mohawk. If you have a hair dryer nearby, use it to dry your hawk! Feathers LOVE steam too, so even better if you have a steamer. It will make them puff out, making your mohawk even more awesome. I have worn my head pieces in mild rain without taking it off and they have been fine. Also please note there is a 'bird' smell that is natural to feathers that you might notice but will go away once they dry. I usually spritz my feathers with a yummy scented body spray when this happens. Overall my suggestion is try your best to stay out of any heavy rain, dry it out if it does get wet and you'll be fine! ****Earrings and accessories are not included. ****If you live in the Honolulu area we can arrange a meetup so that your shipping is waived! If you would like to make a partial payment on an item, please let me know and I will setup a custom listing for you. We can break it into chunks of 2-4 payments. Payment is due in full before I ship your item out. Just let me know, I can work with you! Many items are already ready to ship and will be shipped within a couple of days. If they are made to order it will typically take 1-3 weeks for me to make your item. However depending out the time of the year and inventory, it can up to 8 weeks (not likely though!). I am very flexible and can work around the date that you need it by, and it is possible for me to ship something out to you the next day with expedited shipping. Feel free to message me directly or call me at 808-799-5755 if you have any questions. Please let me know in notes during checkout the date that you would like to have your item in your hands, otherwise I will ship as soon as possible. If I cannot fulfill in the time you specify I will let you know and give you a full refund if you would prefer not to wait. If you place an order and I cannot fulfill an order by the date you need it, I will issue you a full refund immediately. Your satisfaction is extremely important to me so if you are unsatisfied with a product I have made you, please let me know immediately and I will do whatever necessary to make you a happy camper! If it is a custom piece, there is no refund , however you can send it back and I will be happy to make some adjustments to it to your satisfaction! Please do not hesitate to contact me directly to discuss options so that we can come to an agreement where we both walk away happy! If there is something wrong with the item itself due to my own mistake I will be happy to pay for shipping for you to return so that I can fix it and in some cases issue a refund. Partial refunds are also an option depending on the situation. Feather Mohawks - How secure is the clip? I provide hair ties and step by step instructions along with a video on how to wear your mohawk. Once it's on - it's ON! In fact, they were designed to be able to withstand dust storms at Burning man! It is a piece that can literally be worn all day - I even slept in mine once. If you follow the instructions on how to wear it and really secure it in place(super tight hair ties, extra hair gel!!! ), you should not have any problems with it falling off. I also can add an adjustable strap if you have little to no hair or would like the option at your request. Feather Mohawks: My hair is short, bald or I have a very sensitive scalp so I prefer a strap as opposed to a clip. If there is no drop down option in the listing, just let me know in notes during checkout and I will add an adjustable strap to your mohawk. Feather Mohawks and Headdresses: Just how custom can you make my piece? If you can think it up, I can make it! Contact me to discuss if you do not see what you are looking for. I love to take on new projects. More examples of my work can be found at www.facebook.com/artfromtheheART or feel free to add me at facebook.com/artisticalshell and take a look through my albums or tagged photos of people proudly the pieces I have made for them! Can I see it before you ship it? Yes! At your request, I will email you a photo of the exact one you will be getting before I send it out so that I get your seal of approval! I can also Skype, Facetime or send you a video at your request. How many changes can I make after you show me a photo of my piece? I don't place a limit on perfection. I will make as many changes as necessary until you are happy with it! Extra charges may apply if you request something that is going to take a lot longer to create or if it has to be special ordered. How much will my feather mohawk or headdress weigh? They're actually quite light - as feathers! +Larger Mohawks are about 6-9 ounces. +Headdresses can be anywhere between 6-1.5 pounds depending on what materials are used. 95% of the time they are always under a pound. How long before I receive my piece? Please allow about 1-4 weeks for me to get it made for you and shipped out so you can rock this baby out on the town, party, rave, festival, carnival, mardi gras, photoshoot, concert, New Years Eve, Halloween - anywhere you want to WOW people and turn heads, this is what you need!!! NOTE: If you need it by a specific day sooner than the 2-4 week waiting period, please let me know so we can work something out. 95% of the time I can make it within the time period that you need, as soon as a next day turnaround! US ORDERS: Once it it ready, unless otherwise specified I will ship your item via USPS Priority Shipping which takes about 3-5 business days. If it is time sensitive I will send via USPS Priority express which takes 2 days to arrive. If you would like to use FedEx or UPS please let me know, additional charges will apply. Everywhere else: I use registered mail, which takes 6-10 business days. If this is time sensitive then I can send via Global Express shipping for an additional fee and takes about 5 business days to ship as long as customs does not hold your item back. UPS and FedEx are also options for an additional fee. Once it's on, you rest be assured that it will be on securely and comfortably - I've even forgotten that I have it on sometimes! Holds on tightly with a with a banana clip & hair ties (included). No headband needed! This is something you can wear to a party and swing your head in any direction without feeling like it might fall off! FUN! Can I use UPS or FedEx instead of USPS? Absolutely! Let me know which company you prefer to ship. Additional charges may apply.